When I was younger the theatre was something you did if you were a little bit posh or a student of the Arts. I can’t quite remember when the first time I visited a theatre was, perhaps a primary school trip or something. But I do know that from a young age I was very much attracted to stages, music and performance…it just drew me in and everything about it made me happy. I feel strongly now as a mother that as it makes me excited, and as I have such fond memories associated to theatre experiences, that it is only natural that I would want for my kids to enjoy it too (or at least see the beauty in something I am passionate about). 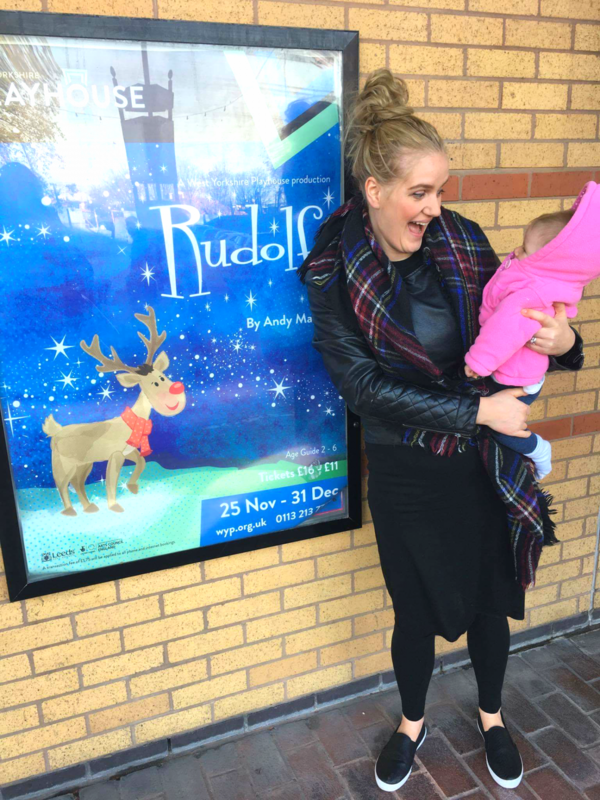 Of course then I was over the moon to be invited last week to see Rudolf at the West Yorkshire Playhouse, and even more excited to give Alice her first taste of theatre (theatre before food…we must be posh!). Whilst I had no idea what to expect both from her or the play, I just hoped she would be chilled out and that it would be a lovely afternoon out doing something I enjoy with my littlest…and it was just that. 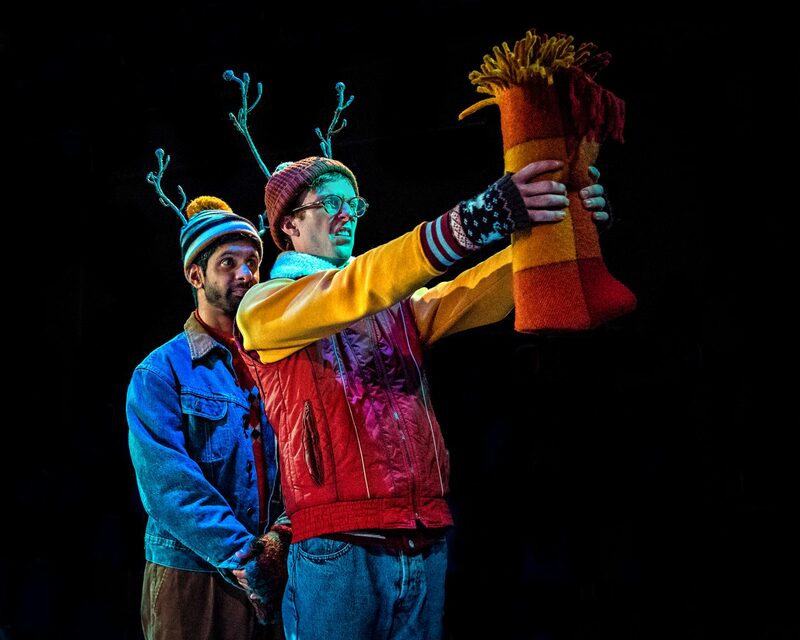 Rudolf sees Santa’s most famous reindeer discover the importance of kindness on a magical journey of discovery and friendship in this witty, laugh out loud, family fun performance. All he has ever wanted to do is pull Santa’s sleigh, “but only the best reindeer get to that. And the best reindeer don’t have red noses”. 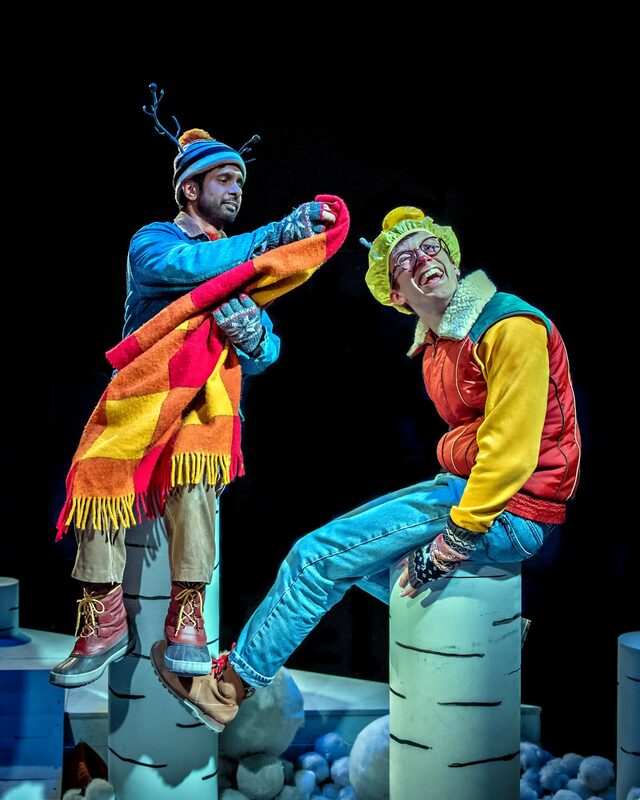 It is such a lovely play, where you get to feel a part of Rudolf’s journey, from worrying he doesn’t fit in and feeling like he’ll never get the chance to pull Santa’s sleigh, to meeting the kind Ugly Duckling and many humorous adventure’s in between…the question throughout though is – will he make friends and fulfil his destiny? Both Mitesh Soni and Peter Hobday were brilliant! They interacted wonderfully with the audience and continued well through kids chatting, babies whining and people rustling…it really is a family friendly performance! The majority of it saw Alice standing on my knee staring at the stage. She loved what she was seeing, and it dawned on me that theatre is the perfect sensorial experience for babies and youngsters. For Ethan and Megan I know they would see the entertainment factor, and are drawn in to the story line…their imaginations run wild, and they ask a tonne of questions throughout any theatre experience. But for Alice the joy came through the lighting, movement and sound. She watched and followed the actors and with each sound effect and lighting change her body would jump, move and fixate. She seemed to love what was going on and it was only in the last 15 minutes that she became tired and fidgety, which was easily controlled with a feed! We had a lovely afternoon together with friends and I just thought how perfect the performance was to introduce young children to theatre this Christmas. The whole thing isn’t very long (maybe 45-50mins), but is engaging and imaginative throughout. It has elements that appeal to everyone in the family from babies to older kids alike, and is a wonderful Christmas adventure that is the perfect after school or half term treat this Christmas time for your family! So why not head down and ignite the imaginations of your children in this delightful story of the true meaning of Christmas. I found it funny, heartwarming, captivating and clever, and just long enough with a baby in tow! It is on NOW at the West Yorkshire Playhouse and runs until the 31st December…so be quick – it is selling out fast. 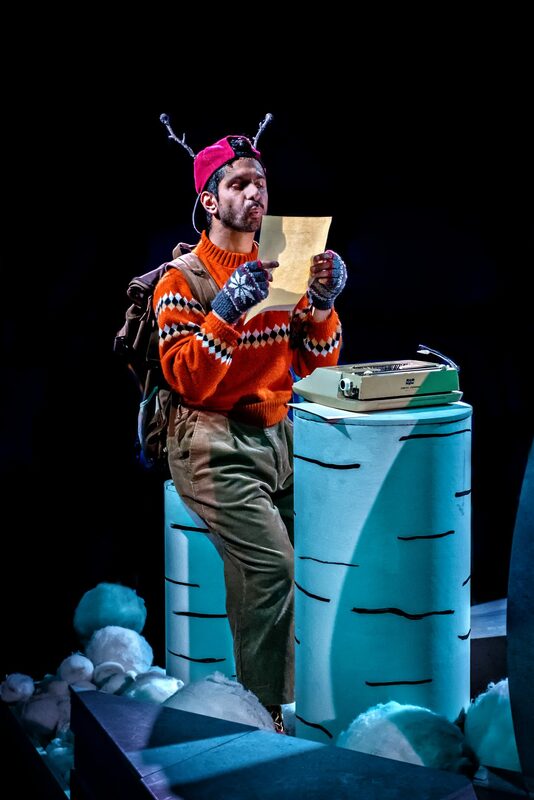 *Thank you to West Yorkshire Playhouse for inviting us along to preview Rudolf in return for a review. Images of the performance were taken by Anthony Robling and provided for the purpose of this review. That is a good idea for the kids this Christmas Season. I hope I have that Rudolf Theatre event here in our place too. Thank you for sharing this wonderful blog post here. This review is as misleading as the poster outside the Playhouse: a four-legged creature plays no part in the production yet one is featured in the advertising materials. The production of ‘Rudolf’ we paid to endure today bore no relation to that described above. Absolutely zero audience participation, no songs, no Rudolf, a dire script and no clarity of purpose. A glance from time-to-time around the auditorium revealed a sea of unimpressed faces. 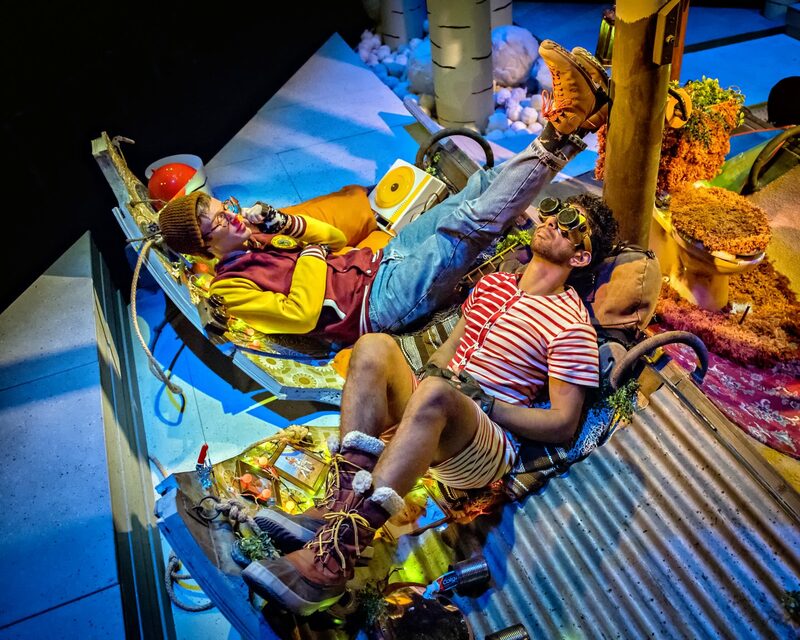 When, 45 minutes in, an intelligent and thoughtful three year old asks ‘Where’s Rudolf, where’s the sleigh, where’s Santa?’ you know that their first visit to the theatre has been a failure and you worry that they may have been turned off theatre for the future. The Christmas productions at the West Yorkshire Playhouse have always been a joy for us. Not this year! Hi Victor. Oh my I am so sorry to hear that you didn’t enjoy it…when we went, everyone seemed to be getting into it and loving it all. I really liked the way it was presented,enjoyed the music and there was (as I said) interaction with the audience. Perhaps they edited parts??? I don’t know, but I understand things also are not to everyone’s taste, and hopefully it hasn’t extinguished your 3 year olds desire for the theatre.